Be careful, because playing Nintendogs can apparently get you attacked by a real dog. A somewhat disturbing story has come out of the UK about a little girl that was viciously attacked by a dog possibly because she was playing Nintendogs. While this might at first seem like the unjust blaming of videogames by a publication known somewhat for doing so (the Daily Mail), this attack actually could be the result of an unfortunate coincidence this time. Nine-year-old Megan Walker was playing Nintendogs on her Nintendo DS at a family friend's abode while the house Bull Mastiff named Saracen was sleeping in a nearby room. Reportedly, when the Mastiff heard Walker's in-game dogs barking it came gunning for her, dragged her off of a sofa, and bit a large portion of her lip off. The girl was taken to a hospital where surgeons were able to sew her lip back on. Though she's doing better, it's unknown if she'll need plastic surgery or not. The mastiff was put down as a result of the attack. Walker recounts what happened: "[Nintendogs] barked and Saracen dragged me off the couch by my foot. I was scared." Walker's grandmother says: "I blame the game for what happened to Megan. If they hadn't been playing it I don't think the dog would have gone for her." So what do you think? 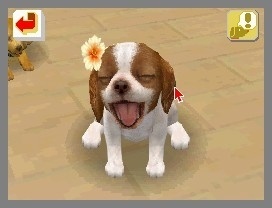 Is it actually possible that the noises coming from Nintendogs were the trigger for such a violent attack? Some dogs certainly have violent tendencies, but the dog's owner told police that that little girl may have kicked Saracen, so videogames weren't the only possibility here. In this case, above others, it actually seems plausible that a videogame was partially and coincidentally responsible for a terrible event, though I wouldn't exactly blame Shigeru Miyamoto for a coincidence. Then again, if a dog is that violent it shouldn't be running free around nine-year-olds, so its owner was ultimately responsible rather than the game.